Disneyland is full of little details that you're likely to miss if you're not looking carefully. Over my many (many, many, many) visits, I've noticed a lot of little things that I couldn't quite explain. How many of these mysterious spots have you seen? I was waiting for my very necessary coffee in the Market House on Main Street before the park opened one day, and as I waited I wandered around to take some pictures of the cute decorations I really hadn't paid any attention to since the coffee shop was rethemed when it became Starbucks. 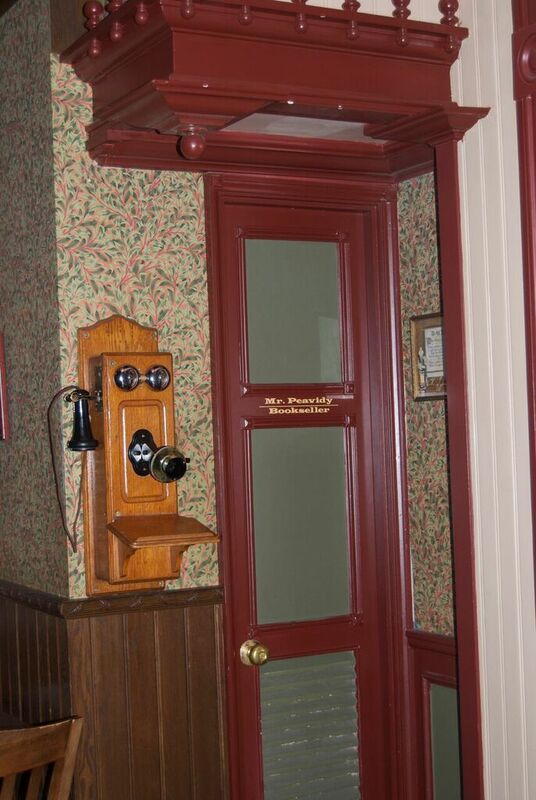 As I started to take a picture of one of the old "Party Line" phones, I noticed the door next to it. "Mr. Peavidy, Bookseller." I couldn't get it out of my head. Who in the world is Mr. Peavidy? Thanks to Laughing Place, I got my answer! The backstory is that Mr. Peavidy is a retired teacher who's now opened a coffee shop with a "Book Rest" area for relaxing and reading. I really love how so many places in the park have detailed back stories that are never even told. They're just left for us to find and discover! Fun Fact: Along with the party line phone, you can also find the old pot bellied stove and checkers table from the original Market House! 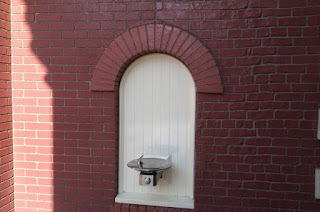 Have you ever noticed this little bricked up archway in New Orleans Square? It has the year 1764 on it and absolutely no explanation! Rumor has it that this is part of an old backstory about the pirate Jean Lafitte that would have tied the Pirates of the Caribbean, Haunted Mansion, and Tom Sawyer's Island all together. You might recognize his name from the Lafitte's Landing sign above the Pirate's loading/unloading area. 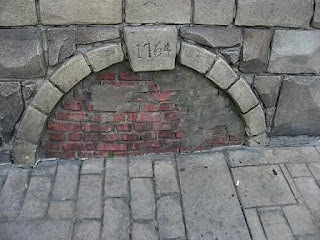 The rumors say that the Mansion would have been owned by Lafitte and that this archway would have led to some kind of tunnel under the Rivers of America and over to his lost, sunken pirate ship at the island. Unfortunately, this idea was abandoned and all were left with is this strange, out of place archway. While we're already thinking about New Orleans Square, lets talk about the Haunted Mansion! When you're in the big ballroom "swinging wake" scene, you may have noticed a spider that sits on the past pane of glass that you look through. If you look carefully at it, the spider's "web" is actually broken glass! The story goes that, back in the day, a kid with a BB gun shot at the glass. The panes go from ceiling to floor and would be unbelievably difficult to remove, so Disney opted to just cover the broken bit with a spider! Have you ever noticed this wall near the lockers on Main Street? At first glance it's just a brick wall. But when you really look at it, there are different types of bricks and styles of masonry. Legend has it that this was the "test wall" when Disneyland was being built that imagineers used to help them decide how bricks in the park should look. The most mysterious part is why the wall is still there! What do you think? The most popular theory is that they ran out of time to tear it down, but at this point they've had 60 years! Our last mystery for today is the one that bothers me the most. I've been Googling this nonstop and haven't found any kind of answer! 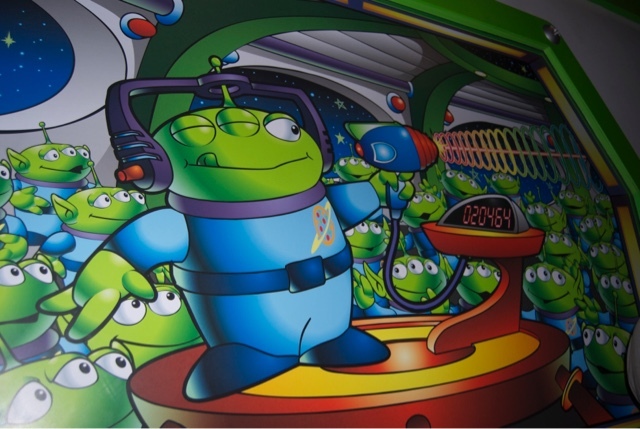 The alien's score in this picture in line for Buzz Lightyear's Astro Blasters is clearly a date. What's the significance of February 4, 1964. It's the release date for Winnie the Pooh and the Honey Tree, but that doesn't have anything to do with Toy Story or that spot in Disneyland. I'm starting to think its the birthday of one of the Imagineers who worked on the ride, but I really have no proof. Anyone know?? ?